This week added a nice SnapCode feature for working with the standard graphics coordinate system: a new method on the Scene class called setShowCoords(boolean) to have the scene draw the coordinate system along with the current mouse point. This makes it easier to plot coordinates in the scene. 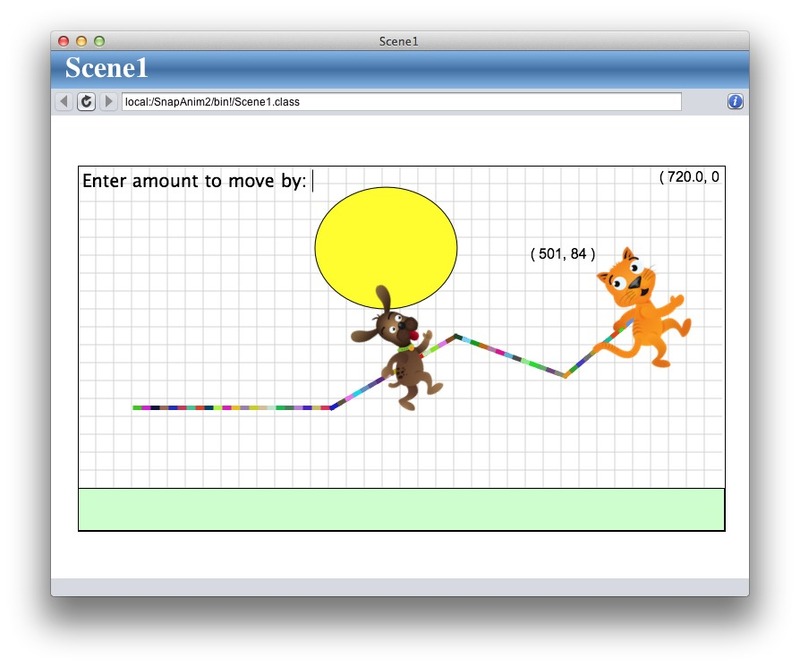 Additionally, there are a couple new methods to customize the scene and console. The Scene class has a getColor()/setColor() method. And you can now ask the Scene for the Console, which has new methods to set the Font and FontSize. Finally, there are a couple of new actor methods to get the angle and distance to the mouse or another actor: getAngle(“Mouse/Actor-Name”), getDistance(“Mouse/Actor-Name”). These make it easy to have an actor point or move to the mouse or another actor. Here is an image of the scene with ShowCoords enabled. This entry was posted on April 11, 2014 at 2:55 pm and is filed under SnapCode. You can follow any responses to this entry through the RSS 2.0 feed. You can leave a response, or trackback from your own site.